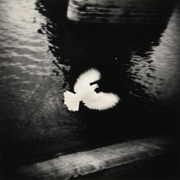 offset (ED 44/60), 70.2x81cm, 1995.
offset (ED 15/60), 50.2x40.2cm, 1998.
gelatin silver print (ED 6/45), 50.9x40.7cm, 2007. Silkscreen (ED 447/450), 61.2x65.8cm, -. 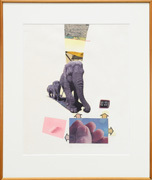 mixed media(ED 41/80), 51.8x32.8cm, 1972. 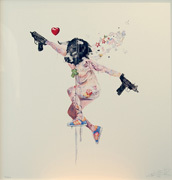 Lithograph (ED AP), 62.5x91cm, -. silkscreen (ED 73/400), 64x67cm, 2007. 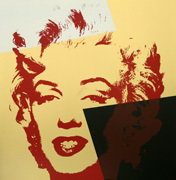 Lithograph (ED 3/20), 57x76cm, 1996.
screenprint in black and red on white baked enamel aluminum panel (ED 63/100), 38x60.9cm, 2004.
screenprint in colors on wove paper (ED 27/100), 101.9x71.1cm, 1987. Silkscreen (ED 9/250), 94x69cm, 1993. Print on canvas, 21.0x29.7cm, 2005. Silkscreen (ED -/2000 , *Sunday B. Morning), 91.7x91cm, -. Screenprint/cotton paper A-lined dress, 96.0x60.0cm, 1965.